Is Yogurt Food of the Gods? Good morning to all of you. If you happen to live and shop in beautiful downtown Victoria, British Columbia, forget the weatherman. Look not to the skies today but something closer. If one inspects the streets we know and work on, one may find a Greek God giving out samples of yogurt. Who knew the Gods of Olympus had time for such things. And ladies, hands off the olive-oiled chest. Victoria, B.C. – (May 3, 2012) – Hain-Celestial Canada, ULC, a leading natural and organic food company, will give away almost 2,500 tubs of The Greek Gods™ yogurt in downtown Victoria tomorrow Friday May 4th 2012 between 11.30am – 2.30pm. Commuters can enjoy this delicious treat for free, while also meeting with ‘The Greek God’, who will bestow the yogurts upon Victoria. “We are excited to offer people in Victoria a taste of our indulgent traditional Greek Style yogurt. 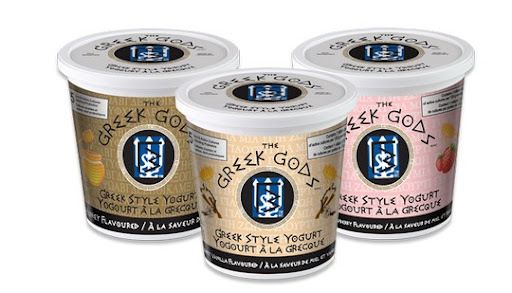 The Greek Gods™ yogurt is a great option for a nutritious main meal or snack,” says Heather McTavish Taylor, Vice President, Marketing of Hain Celestial Canada. The Greek Gods™ yogurt has five active and live cultures including probiotics and is available in four flavours – Plain, Honey, Honey Strawberry and Honey Vanilla. The 650g-sized containers will allow many residents of the beautiful island to enjoy this delicious yogurt. This entry was posted in Food, Reviews and tagged Product Reviews. Bookmark the permalink.